The Christoph Keller, Jr. Library is thrilled to publicize the news that T. Felder Dorn will speak about his newest book, Challenges on the Emmaus Road: Episcopal Bishops Confront Slavery, Civil War, and Emancipation, at the New York Public Library on Wednesday, January 14, 2014 (South Court Auditorium, 1:15 pm). In his message telling us about this upcoming talk, Dr. Dorn writes that “a lot of the early research … for Challenges on the Emmaus Road was done at GTS.” Dr. Dorn’s research began in our former St. Mark’s Library, and he remarks that “When I used the GTS Library beginning in 1999 and continuing for many years, there was an old card catalog that I used regularly. Many of the items therein were not in the computer data base. The stacks, where the card catalog items were housed on the 3rd and 4th floors, were open, and I would bring items downstairs.” We are glad to report that more of this material is now listed in our online catalog, and it’s all housed in our state-of-the-art Special Collections in our gorgeous almost-new building. Dr. Dorn last visited us to complete his work in 2012, he has generously donated his manuscript for this volume to our Special Collections and Archives, and our students have already begun to use this primary source material in their own work. We are looking forward to Dr. Dorn’s talk in January, and we hope you can join us. From the NYPL news release: “T. Felder Dorn, a writer in residence in the Library’s Werrtheim Study, is a graduate of Duke University and holds the Ph.D. in Chemistry from the University of Washington. His academic career included service on the faculties at The University of the South in Sewanee, TN, and Kean University in Union, NJ. He also held appointments as a school dean and vice president for academic affairs at Kean and served four years on the staff of the College Entrance Examination Board. 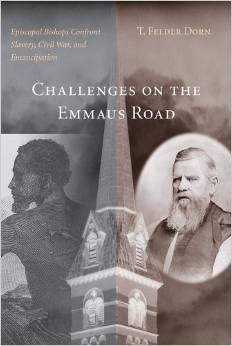 In addition to Challenges on the Emmaus Road, his books include The Guns of Meeting Street: A Southern Tragedy and Death of a Policeman; Birth of a Baby: A Crime and its Aftermath.” Follow this link to find out more about Dr. Dorn’s talk in January!